When I received an unexpected package from our erstwhile editor, Brian, I was naturally curious to find out what was inside. As I upended the envelope, two tins of Altoids came tumbling out. (editor’s note – thanks go to the gang at Altoids for the tins). At first, I was a bit puzzled, since Brian is fully aware how much I hate things that are hot or spicy, and regular Altoids certainly fall in that category. On closer inspection, however, I realized these were actually licorice (or “liquorice” if you want to get all British on me) Altoids. I had no idea they even made licorice flavored candies, and I immediately opened a tin. As the fire erupted in my mouth, I could be heard yelling “The fire, the pain! Help!” as I ran to the kitchen to drink directly out of the milk container. I may have run over two small children in the process; I really have very little recollection of the incident. I think my subconscious has blocked it out so I don’t spend the rest of my life curled up in a little ball mumbling about how evil Altoids are and how I should have known better. Needless to say, I didn’t like these. In fact, I can say with all honesty that I loathed these. Not only do they not taste like licorice, but even if they did, you wouldn’t be able to tell because all the taste receptors on your tongue are being burned to a crisp. Ok, not really, but that’s what it feels like. I can easily say that anyone who likes regular Altoids should have no problem with these, since there is pretty much no licorice flavor and you must have no taste buds to begin with. I love these! and the ginger ones too. But i could only find these at target. I buy these at Trader Joe’s all the time. I think they’re fantastic. Yes, they are spicy, but liquorice should have a little kick! I’ve never been tempted to try the licorice Altoids, and after reading this, I’m glad I haven’t. I’m also glad that Callard & Bowser decided not to make licorice one of the varieties of chocolate-dipped Altoids. These were a great favorite of mine and I can’t find them anywhere. I am so sorry to hear that they are no longer being made. They got me through a severe throat infection with no drugs needed and kept my sinuses open. 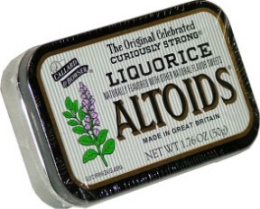 They are definately the best of the Altoids. I LOVE the Liquorice Altoids most. I also find that I like most foods unadulterated because of my sensitive taste buds. Dichotomy. Love the Liquorice Altoids! Yes, they are spicy-hot, but they really do actually have a nice licorice flavor (imo). Unfortunately, Trader Joe’s has discontinued stocking the item. Where else can I find them now?? I bought a tin of them a while back… I had been on a liqourice kick but didn’t want to get the usual good n plenty’s that I usually would go for. I tried one, but didn’t initially like them. Then recently I found them again in a disorganized drawer, and decided, what the hey, I might like them now. Indeed, I do like them now and will pop one in my mouth whenever I get the craving to eat something (I’m kinda on a diet) that is bad for me. Considering three pieces only have ten calories, I’m hardly concerned. I will say this: I hated liquorice as a kid. Love it now!